6:00PM: Reading by Charlotte Bacon Choyt, AWP award winner and former member of Penn staff. She recently published A Private State, a collection of short stories on U. Mass Press as winner of the Associated Writing Programs. She has taught Creative Writing at Williams college and Hartford College for Women, and has worked as assistant editor of "The Compass," a Penn publication. 7:00-9:00PM: Talking Film screenwriting workshop. Screening of All About Eve (1950). Workshop leader Ernie Vecchione writes, "Is it a play on film or a film that apes plays? Either way, it's all talk talk talk, the big boo boo modern audiences HATE today. It's still riveting stuff, using anecdotes to tell a complete story, an approach rarely done today." The screening will be followed by a discussion. 8:00PM: Xconnect publication party, with poetry readings by Temple professors Toby Olson, Alan Singer & William Van Wert, followed by reception. William F. Van Wert is the author of several recent books: Memory Links (essays, University of Georgia Press, 1995, winner of the AWP Creative Nonfiction Competition); What's It All About (novel, Simon & Schuster, 1996); Stool Wives (novel, Plover Press, 1996); Don Quickshot (novel in verse, Livingston University Press, 1997); The Invention of Ice Skating (poetry, Avison Press, 1997); Proper Myth (poetry, Orchises Press, 1998); Vital Signs (poetry, Urthona Press, 1998, winner of the William Blake Award); and The Advancement of Ignorance (short stories, Bookmark Press, forthcoming). He teaches Film and Creative Writing at Temple University. Toby Olson has published several books of poetry, the most recent of which are We Are the Fire (New Directions) and Unfinished Building (Coffee House Press), and 6 novels including The Life of Jesus and Seaview (New Directions); The Woman Who Escaped from Shame (Random House); and Utah, Dorit in Lesbos, and At Sea (Simon & Schuster). His has received NEA, Guggenheim, and Rockefeller Foundation fellowships, and numerous awards including the PEN/Faulkner Award. He is a Professor of English at Temple University. Alan Singer is a novelist, literary critic and Professor of English at Temple University. His novels include: The Ox-Breadth (New Earth), The Charnel Imp (Fiction Collective), and Memory Wax (FC2/Black Ice). His books of criticism include: A Metaphorics of Fiction: Discontinuity and Discourse in the Modern Novel (Florida), The Subject as Action: Transformation and Totality in Narrative Aesthetics (Michigan). 8:00-10:00PM: Freelance Journalism Workshop, led by Paul Sherman, a former journalist who has published stories in The New York Times, Time magazine, The Miami Herald, and other publications. All are welcome! If you are interested in the workshop or want more information, email Paul. Room 202. 9:00PM: Speakeasy: Poetry, Prose, and Anything Goes, an open mic performance night for Penn students. For more information, email Courtney Zoffness or Emily Cohen. 6:00PM: Philly Talks #5 -- Poets Tom Mandel and Ammiel Alcalay read and discuss their own and each other's work, followed by a dinner. RSVP for the dinner to wh@writing.upenn.edu. Tom Mandel is the author of 10 books of poetry, including Ency (Tuumba, 1978), a foundational work in the early language poetry movement, Realism (Burning Deck, 1991), Letters of the Law (Sun & Moon 1994) and Prospect of Release (Chax, 1996). He attended the University of Chicago and currently lives in Washington, D.C. Recordings from this event that have been made available as part of the PENNsound project can be found here. and will open again on Monday, 3/16. 5:15-7:15PM: Penn and Pencil Club Creative Writing Workshop for Penn Staff. Room 202. 7:00-8:00PM: Reading by Yusef Komunyakaa, followed by a dinner. Please RSVP for the dinner to wh@writing.upenn.edu. Yusef Komunyakaa received the 1994 Pulitzer Prize and the Kingsley-Tufts Poetry Award for Neon Vernacular: New and Selected Poems. He is the author of ten books, including Magic City (1992), Dien Cai Dau (1988), I Apologize for the Eyes in My Head (1986), and Copacetic (1984). He also co-edited The Jazz Poetry Anthology (with J.A. Sascha Feinstein, 1991). His awards include the Thomas Forcade Award (1991), the William Faulkner Prize from the University of Rennes in France (1994), the Levinson Prize from Poetry magazine (1997), and the Hanes Poetry Prize (1997). His new book, Thieves of Paradise, was just published by Wesleyan University Press. He is professor in the Council of Humanities and Creative Writing Program at Princeton University. 5:00-7:00PM: Writing Advisors' meeting, Arts Cafe. 7:00-7:30PM: The Writers House on Kid's Corner at WXPN 88.5 FM! Writers House Faculty Director Al Filreis talks about List Poems on the popular kids' radio show. 7:00PM: Talking Film Screenwriting Workshop presents a screening of Hard Eight (1997), followed by a discussion. Workshop leader Ernie Vecchione describes the film: "Largely ignored first film by the writer-director of Boogie Nights. This is what a character study should be: it establishes its pace and tone from the main character. It's really three separate stories involving its main character that adds to a unique whole. It answers little, but rivets aplenty." 5:00-7:00PM: Roundtable conversation about experimental poetry, hosted by Heather Starr. Poets we'll talk about: (Alice) Notley and (Nancy) Shaw. Arts Cafe. 8:30PM: Speakeasy: Poetry, Prose, and Anything Goes, an open mic performance night for Penn students. For more information, email Courtney Zoffness or Emily Cohen. 5:00PM: Poetry reading by James Tate. 1:00-3:00PM: Saturday Reading Project for Kids! For more information, contact Nijmie Dzurinko. 12 Midnight: LIVE at the Writers House #8 with WXPN 88.5, featuring Lamont Steptoe, Rebekah Grossman, She-Haw, Shulamith Wechter-Caine, Chris McCreary, Ben & Yanni, Carolyn Jacobson, Matt Hart, and James Michael Trainer. 3:00-6:00PM: Taping for Dystopia, to be broadcast on 88.5 FM WXPN. 7:00-9:00PM: Around the Fire: A Night of Poetry. Bring your own and others' poetry and share it by the fire. 4:00-6:00 p.m. Talking Film and Bisexual Gay Lesbian Transgender Awareness Days (B-GLAD) present a workshop with videomaker Terri Dewhirst, Room 202. Terri Dewhirst is an experimental videomaker. She teaches video production at Marymount College in Manhattan. During her workshop at the Writers House, she'll show her short video Endoscope, which sifts through media and medical representations of hermaphrodites and questions the very notion of gender. A question & answer session will follow. 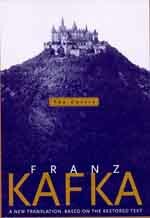 5:00-7:00PM: Reading by Penn professor Mark Harman, from his translation of Franz Kafka's The Castle, published by Schocken Books. Panel discussion of Kafka and translation to follow. Panel participants include, in part, John Zilcosky, Liliane Weissberg, and Kerry Sherin. 7:30-9:30PM: Avant garde musical performance by The Things. 8:00-10:00PM: Freelance Journalism Workshop, led by Paul Sherman, a former journalist who has published stories in The New York Times, Time magazine, The Miami Herald, and other publications. All are welcome! If you are interested in the workshop or want more information, email Paul. 4:00-6:00PM: Informal talk about poet Paul Metcalf, Arts Cafe. 7:00-10:00PM: Screening and discussion of films and videos dealing with REPETITION, curated by Vance Bell and Darren Floyd. 7:00-8:45PM: The Jewish Renaissance Project presents "Video Holocaust Testimonies." "Is there a more or less effective way to respond to the recorded testimony of Holocaust survivors? What are the limits, if any, of our response? We will view short excerpts from video testimonies of survivors, and discuss them by asking these and other questions." To register, call 898-5443 or email djl@pobox.upenn.edu. 6:00-8:00PM: Alumni Writers Series presents Andy Robinson, who will lead a seminar on grant writing. Since graduating from Penn in 1981, Andy Robinson has worked with a variety of social change organizations as a grantwriters, fundraiser, editor and community organizer. He currently serves as developmental consultant to The Wildlands Project, an international conservation group based in Tucson. Andy's book, Grassroots Grants: An Activist's Guide to Proposal Writing, was published in 1996 by Chardon Press. 12:00-2:00PM: Art opening for Edison Fareira School student artists. 7:00PM: Talking Film Screenwriting Workshop, led by Ernie Vecchione. In tonight's workshop, the group will do a sit-down reading from a spec script by Mr. Vecchione himself.